Moving time: 7 hr 58 min. Weather: 55°F (13°C) in the morning; got up to 85°F (29°C) in early afternoon; down to 80°F(27°C)by the end of the ride at 8:00 pm. Clear skies until junction of route 2 then dark, threatening clouds appeared but no rain. Today was a bigger day than I originally thought it would turn out to be. I only need to ride about 55 miles per day to do everything that I want to do but today I did nearly 90 miles. Included in that is nearly 4500 feet of climbing - the biggest climbing day since Missouri. Joe and I had two long 2000 foot pulls - one up the pass between Ennis and Virginia City and the other over Pipestone Pass before Butte. There were no camping facilities available after the 50 mile mark so we pushed on to the KOA in Butte for the night. This is also the first day of the alternate route that Joe and I decided on. There is major construction going on near Sula, Montana and the construction crew will not allow cyclists to ride on the road. We both want to ride our bikes every inch of the way so an alternate seems to be a solution. Donna Lynn Ikenberry's guidebook, Bicycling Coast to Coast, offers the perfect detour. She devised this route in order to bypass construction that was going on in 1995 during her research. The alternate starts in Twin Bridges where it follows routes 41 and 2 to Butte then along Interstate 90 and route 1 to Drummond. The route ventures back onto Interstate 90 until Clinton where it goes on a frontage road to Milltown then on to Missoula where it picks up the regular route. 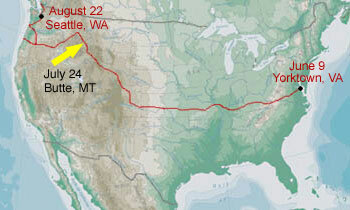 The standard TransAm route goes to Lolo where riders have to take a 10 mile spur to Missoula, the headquarters of Adventure Cycling. The alternate goes right through town avoiding the need to ride a 20 mile round-trip spur. The alternate seems to be about 40 miles shorter than the main route. We did encounter some construction between Twin Bridges and Silver Star but it was more than manageable. 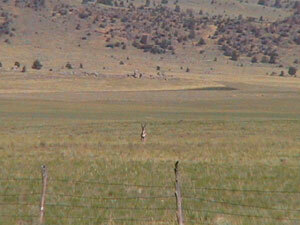 Pronghorn antelope continue to show up from time to time along the roadside. 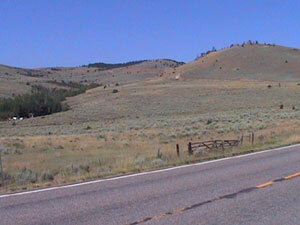 The picture at the top of the page shows a lone buck with a substantial rack in a field by the road. Usually they are in small herds but this one was alone. 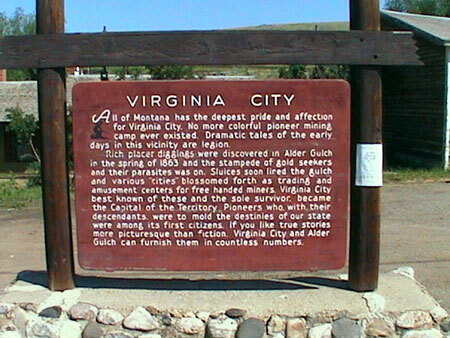 Here are some shots taken of and from the Virginia City pass. The first shows the last 600 feet of vertical climbing and the second shows the view from near the top looking back down into the valley below. 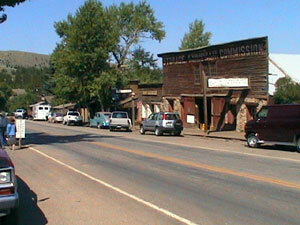 Virginia City and Nevada City are gold rush towns that have been restored to near original condition. They are a treat to visit and offer some unique sights. The greatest part about these towns is that they are not a tourist trap but wholesome, quaint cities with something authentic to offer. 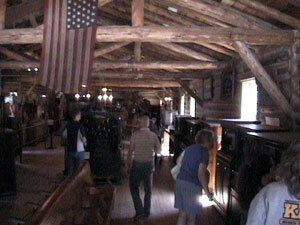 Nevada City has a museum that features old player pianos, kaliopes, silent movie music machines, and viewboxes. It was really neat to play each one. 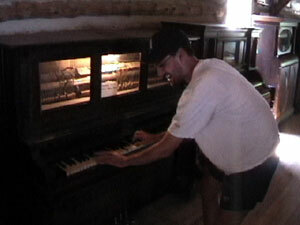 The second picture shows me playing the player piano. I felt like a star! 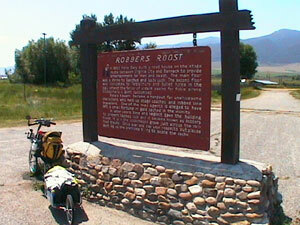 Robbers Roost was a unique place along the route. 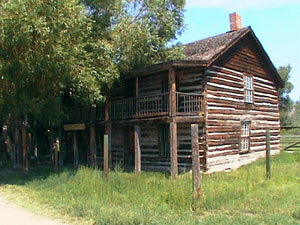 It was once a stagecoach stop but later became a hideaway for for highwaymen and an assortment of thieves. There are bullet holes in the walls of the building from the days when shootouts occured inside. 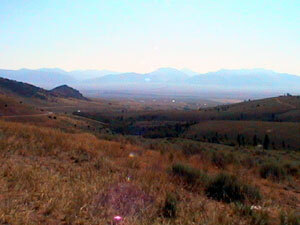 This state is known as "Big Sky Country." I'm not sure who came up with that slogan but they got it right. 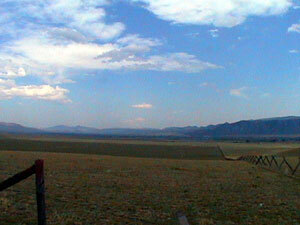 The sky is very open and inviting as the distant mountains barely peek above the horizon in most places. So far this state has been much greener than the last three and the traffic is light. Shoulders are nearly nonexistent in most places but the lack of RVs makes up for that. Food: 2 bran muffins, 2 blueberry muffins, 12 oz. coffee with cream & sugar, 12 oz. orange juice (200 Cal. ), 12 oz. apple juice (200 Cal. ), large oatmeal raisin cookie, 20 oz. iced tea, 6 fried chicken fingers, serving of tater tots, 3 soft and 2 crunchy tacos at Taco Bell, 32 oz. lemonade, pint OJ (240 Cal. ), 1/2 bag SweetTarts, 2 chocolate frosted donuts.